I’d generally agree with your assessment of Teachout vs. Cuomo, and the importance of putting the issue of corruption front and center. I’m not that comfortable with Kathy Hochul, however. If this were Caesar’s Rome, and Kathy was in it, the phrase might have been “Et tu Kathy?” as Julius rolls down the stairs. Is Alfred E. Neuman still running? I don’t think George W Bush is doing much of anything these days. I think I can safely say that it is a given that Cuomo will win. That being the case, Democrats have a greater opportunity to send a message of disgust to Cuomo by choosing Wu as the Lieutenant Governor candidate. The added bonus would be severely limiting Cuomo’s chances for a White House run. When November rolls around, Democrats could wisely refuse to pull the lever for Cuomo/Teachout/Houchul/Wu, but that is about as likely as hell freezing over. I’m having a very hard time with choosing between Wu and Hochul, simply because Wu is so extremely left. Careful what you wish for. Yes, but as Lieutenant Governor Wu would have little chance of enacting his extreme leftist agenda. Wu is not “extremely left”. It’s not like the Lt does anything, how many people can tell you what Bob Duffy did? Cuomo only chose him because he was from western NY. Hochul is a very talented politician, winning county wide in Erie as a democrat (something, that should be easy with the enrollment advantage, but isn’t) and especially winning, and then narrowly losing in very republican heavy congressional seat. Should she win Tuesday, I fully expect to see her become Governor and Senator at some point down the line. Her and her husband are bit too nakedly ambitious and connected for my taste, though, and I plan on voting Wu(and Teachout) in the primary. Also: lol at the idea that Wu is some left wing extremist. Governor & senator? not likely as she has no name recognition downstate…..that could change somewhat if she wins but it would still be a stretch as more widely known and moneyed candidates out of NYC will eventually appear ….. I meant to say Governor or Senator. While many states have a history of sending Governors to the senate, New York hasn’t done so since the 1950’s. Our current junior Senator, Kirsten Gillibrand, also hails from upstate, and did not receive a credible (harold ford, lol) primary challenge after being appointed. Other than the Governor, the only statewide office more prominent than Lt Governor is probably the Attorney General. Hochul will be in a strong position, and will have the state party behind her. I’d first have to imagine that the last four years of Cuomo’s governance didn’t happen. I no longer want Cuomo to run for President. There are better people to for that job. The idea that WNY issues are so vastly different from NYC issues is a perception created from being miles away from Wall Street and Midtown and not actually seeing how the game of politics/business works. Or not actually seeing the height of wealth and political influence. 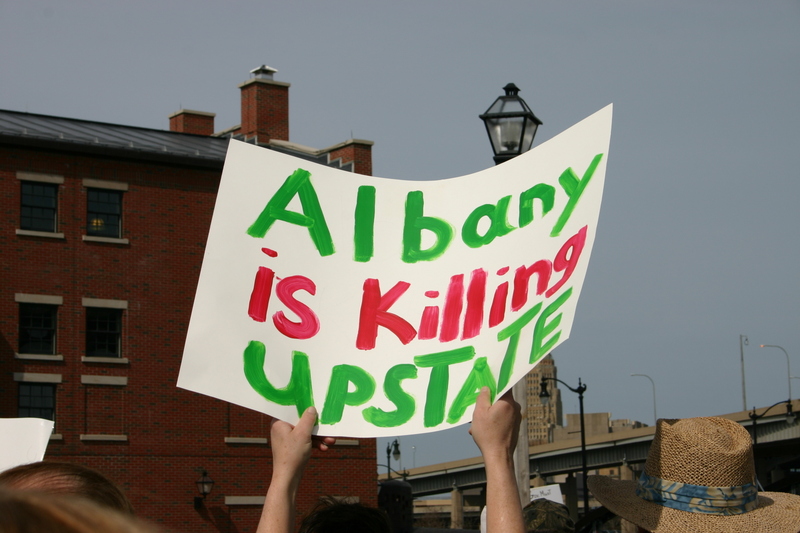 There is no representation in WNY of the height of wealth and political influence. And how are issues like Common Core, paid maternity leave, corporate mega-mergers/net neutrality, fracking or government corruption unique to the five boroughs? She is a profoundly flawed candidate. Nice lady but profoundly flawed candidate. I understand that she’s from Buffalo and thats all that matters to some. For me, I see voting as hiring someone for a job. I would hire Wu over Hochul. He’s smarter, more informed on issues and has explicitly called out the kick-back crony culture of NYState and Cuomo. Hochul is too weak to stand up to anything, let alone Cuomo. She can’t even be trusted to debate the issues on television. She’s just a token WNYer on the ticket. Thats quite obvious. Buffalo is falling right into Cuomo’s game of favors. The Buffalo Billion was a favor, not good governance(thats why it has a name like a lottery game), and now Buffalo feels the need to return the favor. Thats exactly how the game works. I do you a favor, now you do me favor. Thats the Cuomo game. Hochul is just a pawn and Buffalo is too eager to be in good graces with the establishment of New York State to exit the game. Paladino was a complete embarrassment, but come on guys, find SOMEONE in WNY that is 1.liberal, 2. extremely smart and 3. honest to run for statewide office. Additionally, another reason I’m not voting for Hochul or Cuomo is because they refused to engage in a debate of the issues. Hochuls tweeted photos of her shaking hands with seniors is no substitute for a debate. This is a fundamental problem that offends me as a small “d” democrat. We should vote for people based on their ideas and their command of the issues.